Temps are climbing and the wind is picking up. Is has not rained yet, but that looks inevitable. My home has a tin roof with a couple of feet of snow on it. 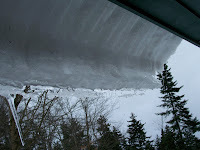 The snow/ice sheet on the roof is slipping, and will crash off anytime. It is so cool when it all goes at once, which is what usually happens. It sounds like a freight train is heading for the living room as it rumbles down the slope of the roof. Then - boom - all that snow and ice hits the ground and existing snow piles. I have errands to do, but don't want to miss the roof going. I jumped around trying to get it moving, which didn't work. But I am obsessed with the roof and I rationalize discussing it here because this is what it is like to live in the Adirondacks. This never happened where I grew up in South Jersey. It is important for anyone considering moving to the Adirondacks to note that weather plays a large role in your life. I think it is great fun.